Central Receiving is working to provide the university community with unparalleled delivery services, utilizing our professional delivery team, new business processes and the OSU Shipment Tracking System. We can provide expedited same-day shipping, standard next-day shipping or specialized scheduled deliveries, as well as pickups for outgoing shipments. 3/18/19: The order entry process for the Amazon Business Account has been modified to require a purchase request number prior to check-out. Amazon Business Account orders will be delivered to Columbus campus locations by Central Receiving. Delivery information for Amazon packages is available by tracking number. UPS & Mail pickup requests must be made by 3 pm for same day pickup. Pickups of more than 10 pieces or 100 lbs. may be scheduled as a bulk pickup for the next business day. Central Receiving now offers a solution to track the status of central campus deliveries for parcels and freight received at 2650 Kenny Road. Please have your OSU Purchase Order Number and or UPS or FedEx tracking number ready. A Shipment Tracking System Job Aid is available on the Shipping ASSIST page. After submitting returns, please attach the form or the email confirmation to the package and leave the item so it is visible to the driver in the same location that is selected on the returns form. Please communicate to others in your department where the return is located in case you are not present when our driver arrives. Outgoing UPS, FedEx and Freight Shipment: Scheduling a Pick-Up by a Mail Services driver is only for items that do not fit in a UPS/OSU drop box. Requests must be made by 3:00pm for same day pick-up. Any pickup larger than 100 lbs. or more than 10 pieces, may be scheduled as a bulk pickup, for the next business day. PO Return: Our vendors typically have a strict 30-day return policy. Please keep in mind, when you submit your request for return, we need time to make the pick up and contact the vendor inside of that 30-day window. To be safe, you should submit your returns ASAP. If you have received an order from a vendor and the order is not correct (the wrong product or incorrect quantity) or damaged, please contact the vendor directly for corrective actions. 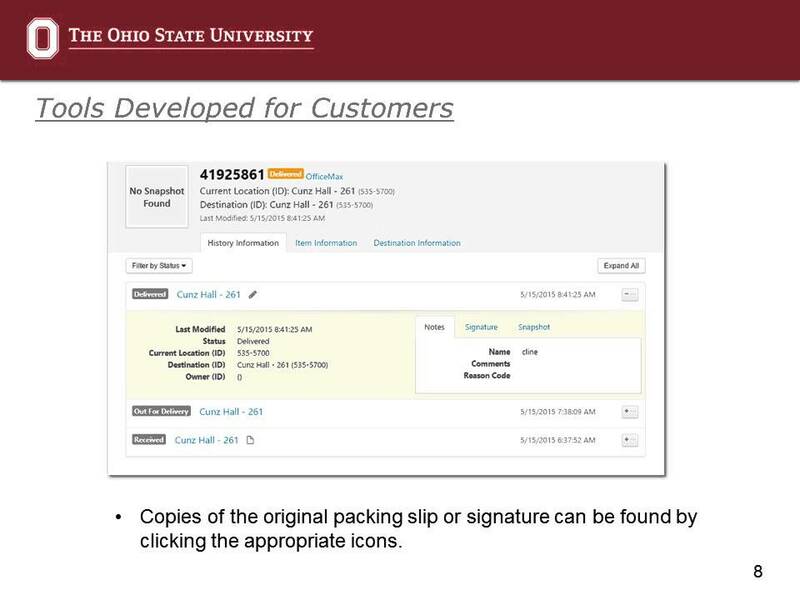 UPS has provided a web portal for all OSU employees to create shipping labels. For instructions on how to receive an account for CVS, please visit Shipping ASSIST. Through collaboration, this project offers a streamlined delivery network that enhances safety, increases delivery capacity and provides dependable, secure service levels.